In fact, the first 1008 sales calls Colonel Sanders made ended in rejection. Still, he continued to call on owners as he traveled across the USA, sleeping in his car to save money. Prospect number 1009 gave him his first "yes." Earlier in his life the Colonel was involved in other business ventures--but they weren't successful. He had a gas station in the 30's, a restaurant in the 40's, and he gave up on both of them. At the age of 65, however, Harland Sanders decided his chicken idea was the right idea, and he refused to give up, even in spite of repeated rejection. He knew that if he kept on knocking on doors, eventually someone would say "yes." This is how Jesus has commanded to approach life. 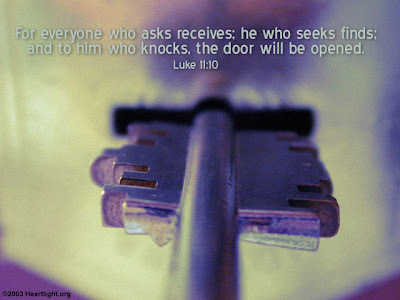 He said, "Ask and it will be given to you; seek and you will find; knock and the door will be opened to you." (Luke 11:9) This verse follows a story Jesus told emphasizing the importance of a "never-give-up" attitude in prayer. Jesus is saying, "Ask--not just once, but as many times as is necessary. Keep on knocking till the door is opened." If you have made half-hearted attempts at doing God's will in your life...if you have given up too easily in the past...remember: It's never too late to become persistent. It's never too late to decide to never give up. Keep on knocking. Keep on asking. Keep on seeking. The Colonel's secret flavor recipe of 11 herbs and spices that creates the famous "finger lickin' good" chicken remains a trade secret. Portions of the secret spice mix are made at different locations in the United States, and the only complete copy of the recipe was formerly kept in a vault in corporate headquarters. * The recipe, which includes exact amounts of each component, is written in pencil on a single sheet of notebook paper and signed by Sanders. * The recipe was locked in a filing cabinet with two separate combination locks. The cabinet also included vials of each of the 11 herbs and spices used. * Only two executives had access to the recipe at any one time. KFC refuses to disclose the names and titles of either executive. * One of the two executives said that no one had come close to guessing the contents of the secret recipe, and added that the actual recipe would include some surprises. On February 9, 2009, the secret recipe returned to KFC's Louisville headquarters in a more secure, computerized vault. What nice story and a fine telling of it.